As fans everywhere know full well, there is some serious bad blood in the air ahead of the big September 15 return fight between Gennady Glovkin and Canelo Alvarez. In fact, not only is there bad blood between the two fighters, there have been some quite nasty back and forth exchanges between the trainers of the two men and between promoter Oscar De La Hoya and GGG trainer Abel Sanchez. Recently, as picked up by FightHub, De La Hoya discussed Sanchez’ ability – or lack of it – as a trainer and spoke about the “very limited” style Triple-G has as a result of working with Sanchez. Strong words indeed from The Golden Boy. Of course, Sanchez’ supporters, along with Golovkin’s supporters, will point to the fact that for a limited trainer and fighter, the GGG/Sanchez partnership has worked incredibly well – with 38 wins, 34 by KO, coming from 39 pro bouts; just the draw with Canelo, most people feeling Golovkin deserved the win last year. Golovkin does come forward a lot, as De La Hoya says, and yes maybe GGG could have cut off the ring on Canelo more efficiently in fight-one. But to say Sanchez doesn’t know what he’s doing is too much, right? 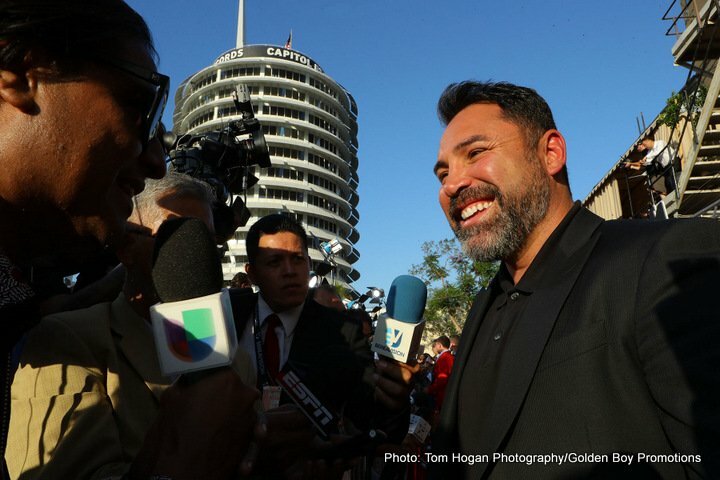 Is Sanchez a good, even great trainer – or is De La Hoya correct in his scathing criticism? One thing’s for sure: if GGG scores a clear win in the rematch, any and all discussion over whether or not Abel is able will go away.